One of my Doctor Who novels is getting a new edition from BBC Books in February 2015. Amorality Tale is part of the The History Collection, a range of eight historical adventures that includes beloved Who novels such as Paul Cornell's Human Nature [which he adapted for David Tennant's Doctor on TV], The Witch Hunters by Steve Lyons, The Stone Rose by Jac Rayner, and The English Way of Death by Gareth Roberts [quite how my page turner snuck on to the list I don't know, but consider me chuffed nonetheless]. Alongside new paperback editions with lovely new covers, the novels will also all issued as eBooks for the first time. 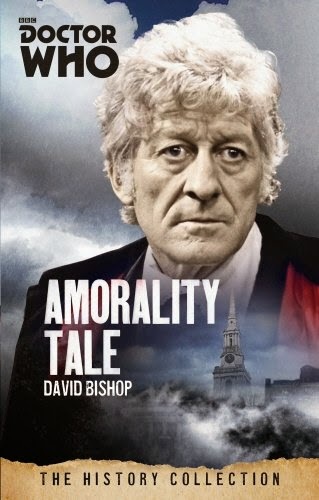 Amorality Tale was originally published in 2002, and marked my return to long form prose fiction after a six year break. It was my first Who novel for the BBC Books, so I poured a lot of care and attention into that book. I meticulously researched the setting [London's East End in December, 1952], got a big gang of beta-readers to give me feedback on the manuscript, and undertook considerable rewrites to finesse the final draft. The result is a dark story that rips along at a fair pace - anyone seeking prize-winning literary fiction is better off looking elsewhere - but still has some humour amidst the sturm and drang.